Foam observed at Griffith’s Priday State Park (Ocean Shores, WA). Last weekend, Carl (COASSTer since 2009) documented a few stranded birds (two Western Grebes, one Brandt’s Cormorant) covered in algae at Griffith’s Priday State Park. 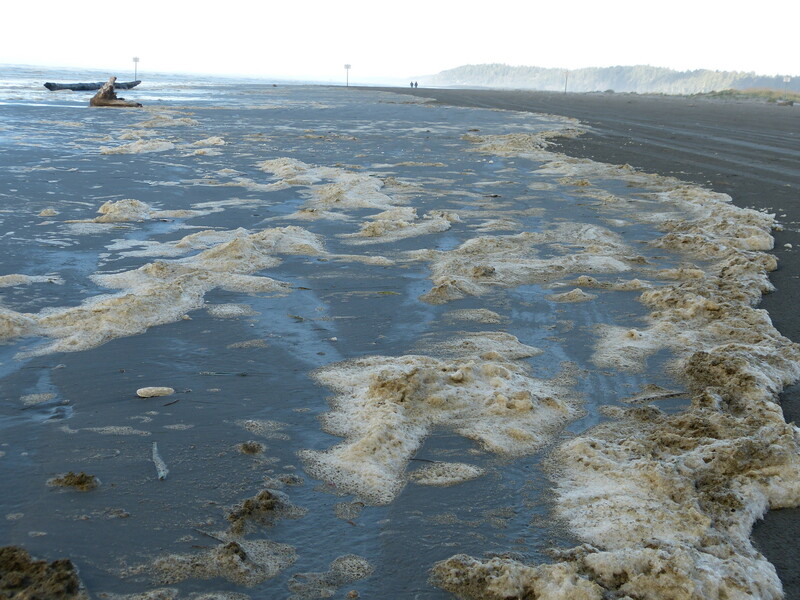 For COASSTers who witnessed the 2009 Akashiwo sanguinea algal bloom, this raised some concerns that the foam on the beach and the algae visible on the birds might be Akashiwo. Thanks to the rapid response of partners Raphael Kudela-UCSC, Vera Trainer-Northwest Fisheries Science Center, Anthony Odell-ORHAB Partnership, water samples collected this weekend will be analyzed for the presence of Akashiwo, with results available as early as next week. We’ll relay the results to COASSTers and keep you posted. This entry was posted in Uncategorized on October 31, 2014 by coasst.